In the property tax realm, property can be categorized as either real or personal. Real property includes land and buildings. Personal property is anything that is not real property and is typically movable property, for example, furniture, machinery, equipment, computers, etc. Both real and personal property can also be categorized as “business use” or “personal use” property. 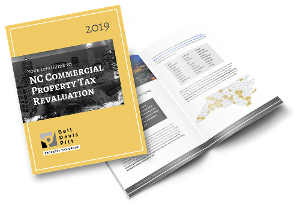 Most real property is taxable, regardless of whether it is business use property (commercial retail building) or personal use property (personal residence). Business use personal property is typically taxable, while personal use personal property is typically not taxable (e.g., the contents of your house). Finally, personal property can also be categorized as “tangible”—it can be seen, touched, and felt such as a desk or a computer—or “intangible”—it cannot be seen, touched, or felt, such as computer software, trademarks, or financial accounts. Most intangible business personal property is exempt, while tangible business personal property is generally taxable. So, the tangible business personal property (“BPP”) that is generally subject to the property tax in North Carolina includes machinery, equipment, furniture, motor vehicles, computers, etc. used for business purposes. Unlike real estate that is revalued only periodically by counties, typically every 4 or 8 years, business personal property is essentially revalued on an annual basis. Owners of business personal property are supposed to list their BPP on prescribed listing forms in January of each year. On the listing form, the property is categorized by year of acquisition and listed at its original cost. Failure to list the business personal property or listing it late can result in the imposition of a penalty. Based on the listing, the tax office will value the business personal property and issue a bill. Tax offices in North Carolina generally determine the value of business personal property by taking the original cost listed and depreciating it utilizing depreciation tables published by the North Carolina Department of Revenue. These tables categorize business personal property into certain types and apply different depreciation schedules depending on the property type. Unlike for income tax purposes, business personal property never depreciates to zero for property tax purposes, but instead depreciates to some residual value and then remains at that value as long as it’s still in use. The most common mistake we see is a failure to remove property that is no longer in service from the listing form. Most businesses use their fixed asset schedule as a starting point for the business personal property listing form, and many businesses do not remove items that are no longer used, like old computers. Because business personal property is depreciated to a residual value and not zero, this results in an inflated tax bill. The second most common mistake we see is including assets that should not be on the business personal property listing form—either because the assets are exempt or because they are real property, not personal property. Of course, this error can go the other way too, where assets that should be listed are not listed because the taxpayer erroneously believes that they are exempt or already taxed as real property. In real estate revaluations, the county sends a revaluation notice to the property owner advising him of the new value for his real estate, generally in the first quarter of the year of revaluation. However, with business personal property, the tax office does not send out a separate revaluation notice informing the owner of the new value each year. Instead, the notice comes when the tax office sends out tax bills based on the business personal property listing form. Tax bills are sent out typically in July and August. For the business personal property owner, this is the only notice they will receive regarding the current year’s value of their business personal property. Generally speaking, the business personal property of all businesses is subject to property tax. Like real estate, however, there are exemptions, principally for charitable, educational, and other not-for-profit activities and institutions. Such exemptions can be very specific, so consult with counsel to determine if the business personal property qualifies for exemption. Business personal property and real estate are taxed in the same manner at the same rate. In each case, the property is supposed to be valued and taxed at its fair market value. The tax rate applicable to each is the same. The tax rate varies from county to county and also within a specific county if the property is located within a municipality within the county—in which case both a county tax rate and a municipal tax rate applies. Tax rates are usually published on the county tax office website. The appeal process for business personal property is the same as for real estate. The business personal property owner first appeals to the county Board of Equalization and Review. If not successful, the BPP owner can appeal to the North Carolina Property Tax Commission in Raleigh. The appeal deadline for business personal property valuation is a trap for the unwary. With real estate, the deadline for filing an appeal cannot be before the first Monday in April and generally is sometime between the end of April and the end of June. One usually knows the tax value of the property before the end of the first quarter and can file an appeal before the end of March to be safe. On the other hand, with business personal property, the owner does not know what the tax value of the BPP is until receiving a bill in mid to late summer. The owner then has 30 days from the date on the bill—not from receipt of the bill—to file an appeal. Frequently, especially with large businesses, the bill may get passed around for some time before landing on the desk of the responsible person. Often, the deadline for appeals has then passed. Additionally, the bill can be paid as late as January 6 of the following year without interest or penalty, so people frequently don’t think about the bill or appealing the value until the deadline for payment approaches, which is too late to appeal. do a cost/benefit analysis to determine if an appeal makes sense. Property tax law and procedure is complicated and often difficult to understand. Furthermore, even among attorneys, most are not knowledgeable on the subject. So, where any significant tax dollars are in issue, it is wise to discuss the matter, at least preliminarily, with an attorney experienced in property tax appeals.